The majority of homes built in the past 50 years have interior walls made with drywall, a product that is relatively inexpensive and easy to install. Drywall consists of large, thin sheets of paper-covered gypsum that are directly nailed or screwed to wall studs or ceiling joists. Plaster walls in older buildings were installed over thin wood strips called lath boards. Today's plaster walls are usually applications of plaster veneer. All plaster work requires specific expertise. Drywall comes in large sheets of paper-covered gypsum. Drywall damages easily through the banging of doors, furniture scuffs and water penetration. Hanging art and mirrors on drywall requires hitting a stud. Wall anchors and adhesive hooks are often ineffective on thin drywall. Areas between wood framing members are unsupported and therefore particularly vulnerable to damage. Settling and framing shrinkage in new homes may cause drywall nails to pop into view. Mounting drywall on ceilings can be difficult because of the size and bulk of the gypsum board. Scaffolding or lifting equipment is often required. Plaster work requires more skill and is therefore more expensive to install. Plaster begins as a powder that, once mixed, has a very brief window of liquidity and pliability. The installer must apply plaster and work it into a smooth and even surface before it sets up and becomes rock-hard. Plaster creates more of an echo in empty rooms than drywall, but, since plaster has more mass, it provides a better sound barrier between rooms. 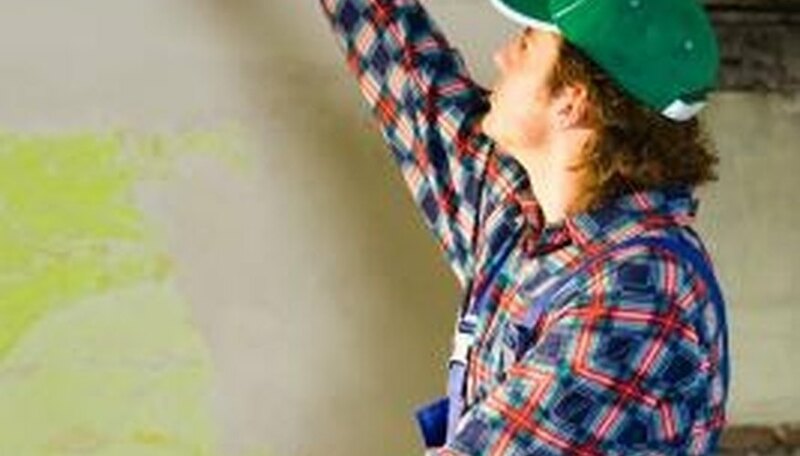 Drywall is far more do-it-yourself friendly than plaster, but the process takes far longer. Drywall sheets are first cut, fitted and nailed or glued to the studs. Drywall compound and tape are applied to the seams between boards and over the nails or screws. The compound must be left to dry and then sanded to a smooth finish. Often many layers of compound are necessary to feather the surface and provide a smooth subsurface for primer and paint. Five or six days are often required. Plaster veneering requires the installation of blueboard to handle the moisture content of wet plaster. Blueboard is a sheetrock look-alike that is engineered to form a tight bond with modern plaster compounds. Plaster is applied over the entire surface of the wall. Installation takes only two days from start to finish, and messy sanding is not required. Plaster is much harder than drywall and can last centuries rather than decades. Plaster must be a complete install and not used in combination with drywall. What Kinds of Subcontractors Work on Building a House?